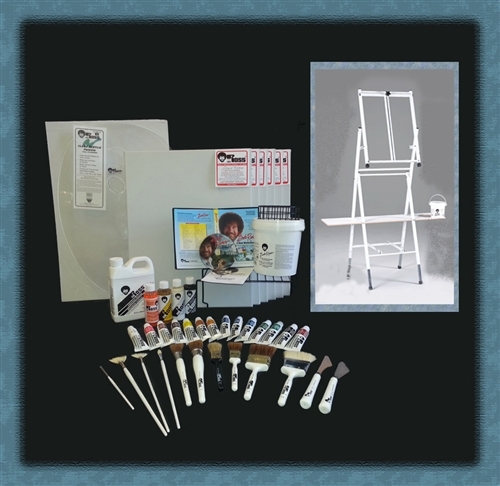 The Bob Ross Company offers several painting kits containg all the painting supplies you need to paint like Bob Ross. 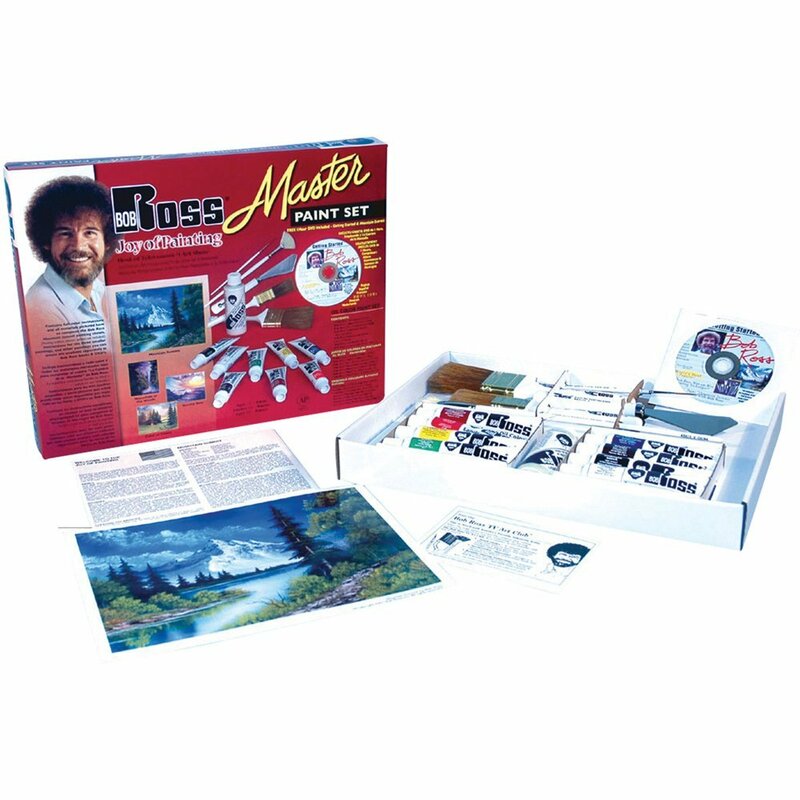 These painting sets ranging from the Bob Ross Basic Set for around $50 to the Ultimate Bob Ross Painting Package for over $800. Here you can find a short overview which supplies the different sets contain and which ones you need to get in addition to the painting kits. 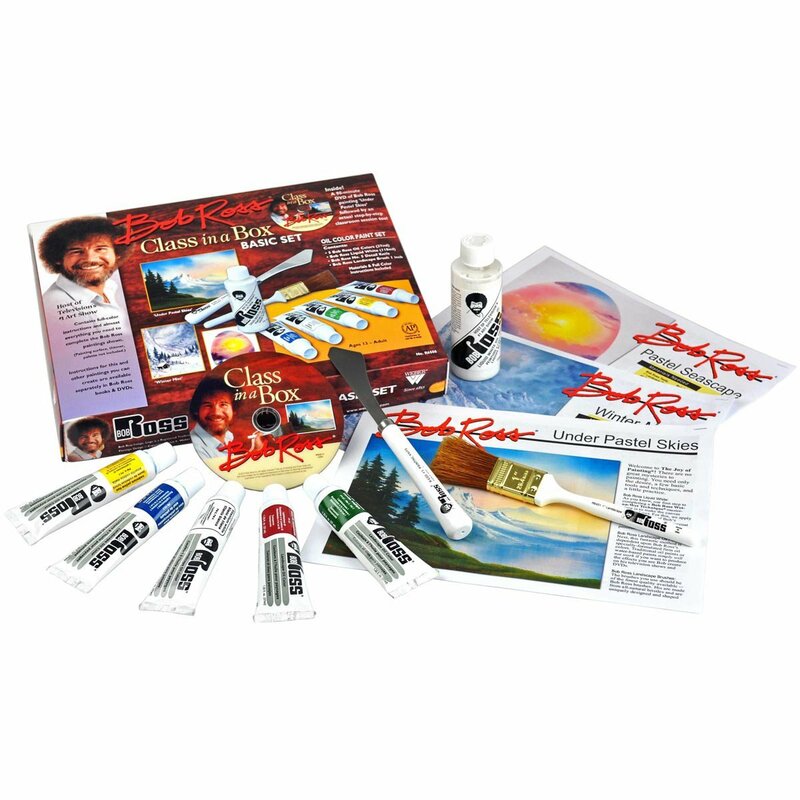 All of the painting supplies contained in these sets have been developed by the Bob Ross company with the ultimate goal to work perfectly for the Bob Ross Wet-On-Wet oil painting technique. This means that not only are the brushes made from the right materials and have the perfect length to work with Bob's technique of painting happy trees and happy clouds but also the oil to pigment ration of the oil paints is adjust for the use of every color. For example darker background colors are firmer than lighter colors used for highlights. This is especially useful for you if you are a beginner since you don't have to thin the paints yourself. Besides paint thinner and a canvas the Bob Ross Master Paint set really contains everything you need to paint like Bob Ross. While the Basic set has all the tools and colors needed to paint one specific picture the Master Paint Set hands you the supplies to paint every single painting you see on 'The Joy of Painting' with Bob Ross. In addition to the painting supplies in the Basic Set you get three more brushes, a bigger painting knife, 3 more tubes of paint and a 'Getting Started' DVD that takes you through your first painting. You can find a detailed review here. 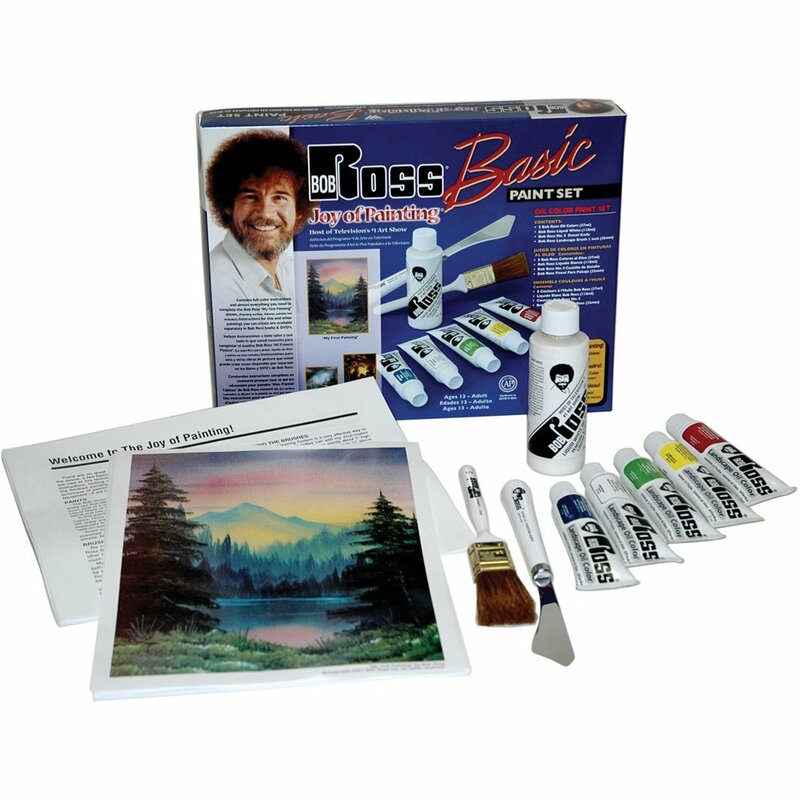 This basic painting set contains the absolute basics to get you started with painting like Bob Ross. With this kit you get a brush, a painting knife, five tubes of oil paint, one tube of liquid white and written instructions for your first painting. 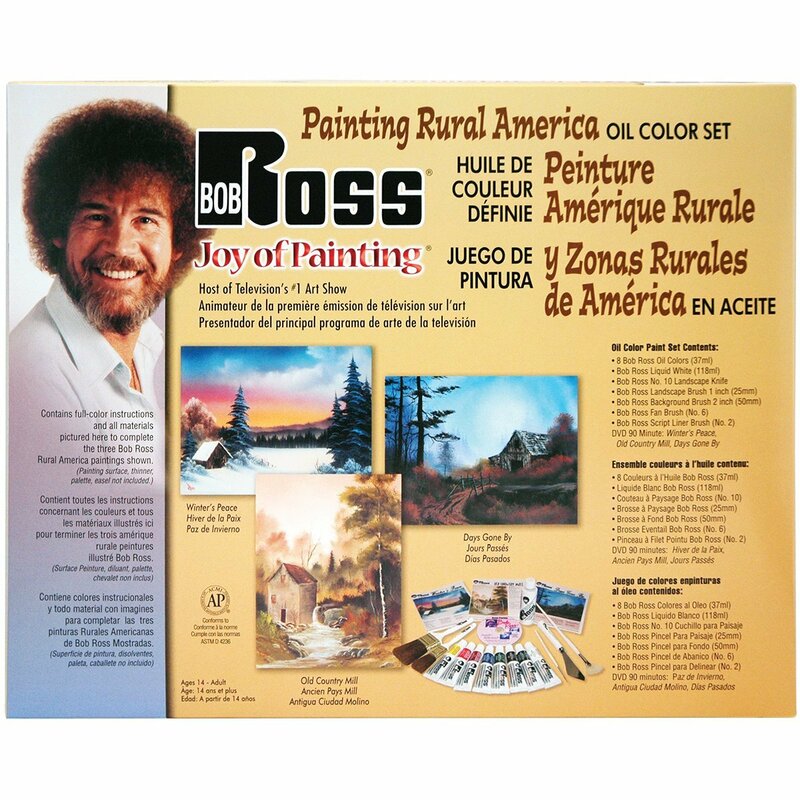 The Bob Ross Rural America Set contains the same painting supplies as the Bob Ross Master Paint Set, so you get 8 tubes of paint, a bottle of Liquid White, a painting knife and 4 brushes. The difference between the Master Paint Set and the Rural America Set is in the instructions that come with the supplies. While the Master Paint Set contains detailed instructions for one painting the Rural America Set contains a DVD and written instructions for three paintings (Winter's Peace, Old Country Mill and Days Gone By) with subjects set in (you guessed it) rural America. This set contains absolutely everything you could ever need for painting along with Bob Ross. With all paints and brushes made by the Bob Ross company and more there is nothing else left for you to want.